Click pay now and continue with checkout. After your payment - Click return to "Good Time Home Services". Enter name + $ amount then click "Pay Now"
All orders safely & securely processed through the PayPal system, but you don't need a PayPal account to use it. just click "Pay with a Debit or Credit Card" and continue. PayPal, the safest way to pay online. We give you a fixed price on all repair and service. We are friendly, fast and reliable. We were very pleased with all aspects of your service. The installation team in particular, was very professional, polite and neat. 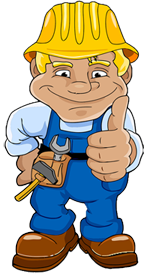 I had a very positive experience with Good Time Home Services. My air conditioning was putting out nothing but hot air and the house got uncomfortable fast. The repair guys came out quickly and the problem was fixed that very afternoon. I am very satisfied and I would use their services again. It was my first experience using Good Time Home Services, and I would highly recommend them to friends , family and neighbors. I will be calling them in the future for all of my Heating and Air needs. These guys are fair, honest and reliable, excellent follow-through and their price was very low compare to other estimate i had. My call for service was handled promptly, the tech was professional and quickly fixed the unit.